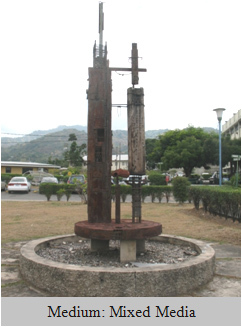 Totem Pole (Spirit of Fire) — UTech, Ja. This sculpture represents a totem of heritage. It has been specially built so that it can be lit thus the reason for its name, ‘spirit of fire’. The fire being referred to by the artist is knowledge. It is intended to burn out illiteracy. Much knowledge has been handed down to us through our ancestors and the artist admonishes us through this work to treasure this heritage. The sculpture has been placed on the outskirts of the Park as it is one of two pieces not representing a Caribbean region. It represents Africa, the mother continent. So while it is separated from the other pieces, the connection remains as the Caribbean is an extension of Africa.